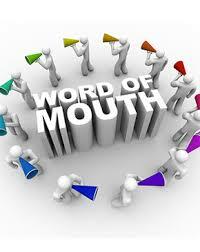 We all know Word Of Mouth is the most powerful form of gaining leads. But how do we get more of them? We can get referrals from a number of sources – not just happy customers. – both current and completed. of their friends or family that might require the same service. this could be as simple as a movie ticket. – you need to be top of mind! reward them for their business. referral and ASK them for referrals from their clients. they are more likely to refer you. 4. Facebook is the new ‘Word of Mouth’. and post relevant tips, information and specials. (and ask them to add you). to give to their clients. and take plenty of business cards. 9. Sponsorship (local schools, sporting groups) and ask them to refer you. guarantee he will be on time or there is no call out fee). do what you say you will do, ASK for the referral and TRACK your results.